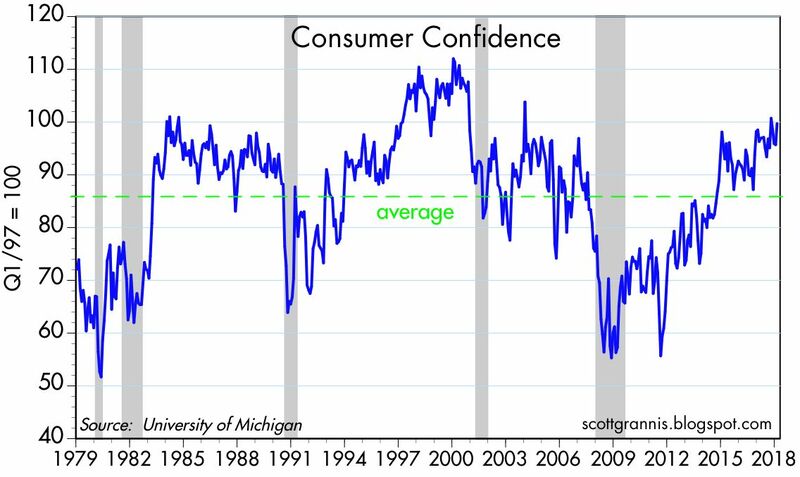 The economy grew 2.5% last year, which is a bit stronger than its annualized rate of growth during the expansion which began in mid-2009, and there's evidence that growth picked up a bit over the course of the year, likely due to a significant increase in business and consumer confidence. Regardless, my reading of the market tea leaves suggests that the market's expectation for future growth is only slightly higher than what we've seen in the current expansion. Although the sharp cut to the corporate income tax rate has found its way into a substantial rise in stock prices (because reducing the tax rate means that the discounted value of future after-tax earnings translates into a one-time boost to current valuations), the market has yet to price in a substantial increase in future growth fueled by the increased investment and jobs creation that the tax cut was designed to achieve. (And to be sure, there is still no convincing evidence of a significant pickup in business investment.) The market is moving in an optimistic direction, of course, as witnessed by rising real and nominal yields, but we're still in the early innings. I've been posting updated versions of Chart #1 for many years now. It shows how unique the current business cycle expansion has been in the economic history of the US economy. 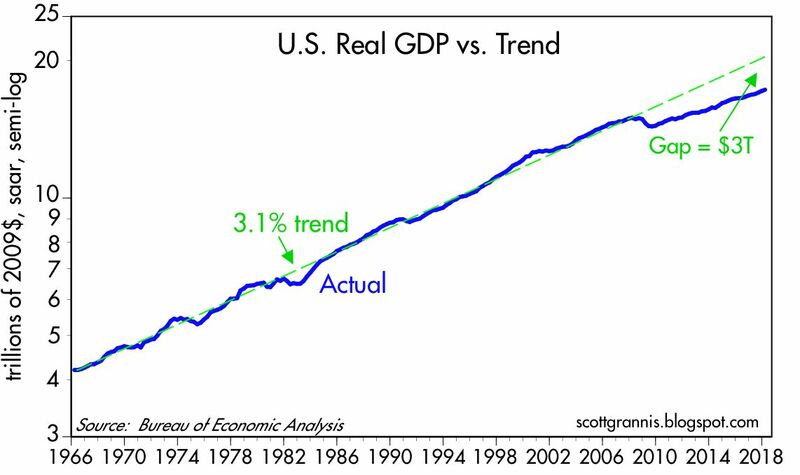 From 1965 through 2007, the US economy grew at a trend rate of about 3.1% per year. 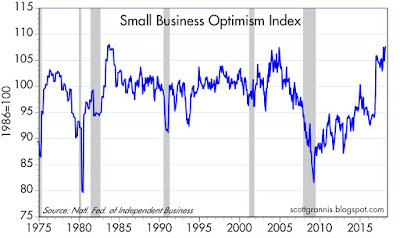 It slipped below this trend during recessions, and exceeded the trend during boom times. But it invariably returned to trend given a few years. (Milton Friedman in 1964 wrote a paper about this, calling it the Plucking Model.) The current expansion has been by far the weakest on record. Relative to its previous trend, the US economy is more than $3 trillion smaller, in 2009 dollars, than it might have been had things played out this time as they have before. What's the cause of this underperformance, especially considering that since late 2008 the Fed has massively expanded its balance sheet? My list of reasons lays the blame on two major factors: 1) an oppressive expansion of government, in the form of increased regulatory and tax burdens, and 2) a shell-shocked market that has only recently regained its former level of confidence in the wake of the Great Recession of 2008-9. Confidence has returned, but only in the past year or so, as shown in Charts #2 and #3. 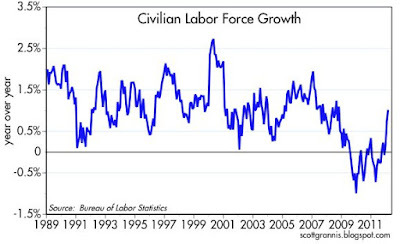 This may be the precursor of increased business investment—of which there is no sign yet—but it does explain the recent surge in the labor force, as shown in Chart #4. It's only very recently that we have seen a big increase in the number of people looking for work. Thanks to TIPS (Treasury Inflation-Protected Securities), we have real-time knowledge of the market's expectation for risk-free, inflation-adjusted returns. (TIPS pay a real rate of interest in addition to whatever the inflation rate happens to be. The price of TIPS varies inversely with the market-determined level of the real yield on TIPS.) 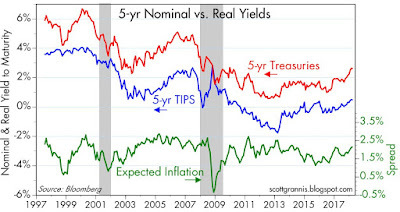 As the chart above shows, the level of real yields on TIPS tends to track the economy's trend real growth rate (I use trailing 2-yr annualized growth as a proxy for what the market perceives the current trend to be), much as common sense would suggest. 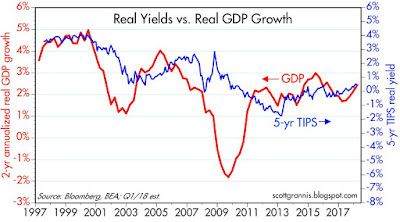 When economic growth was booming in the late 1990s, TIPS paid a real rate of interest of about 4%, since they had to compete with the market's expectation for 4-5% real economic growth. 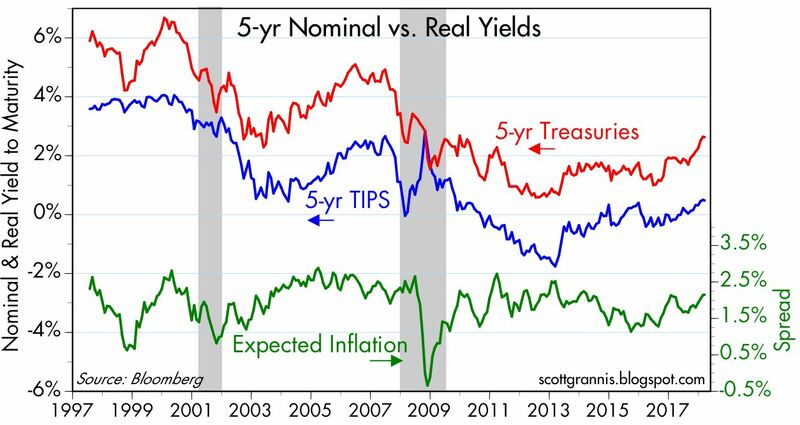 But with the trend rate of growth having now slowed to just over 2%, the real rate of interest on TIPS is only modestly positive: 0.5% for the next 5 years, as of today. If the market thought the US economy were on track to deliver 3%+ rates of growth in the years ahead, I'm confident that the real yield on 5-yr TIPS would be in the neighborhood of 1-2%, if not higher. As it is, I think the market is currently priced to the expectation that real growth will average about 2.5% in the next few years. That's good, but nothing to write home about. 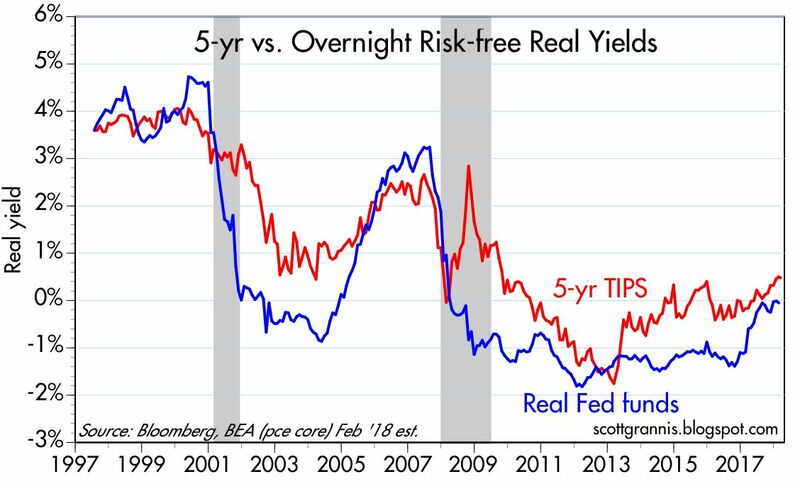 Chart #6 compares the real yield on 5-yr TIPS (red line) with the ex-post real yield on the Fed funds rate, using the Fed's preferred measure of inflation, the PCE Core deflator. 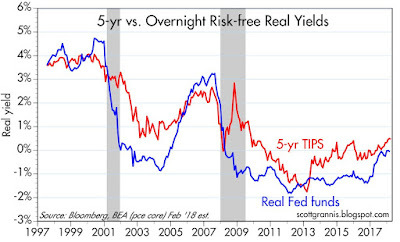 This is akin to viewing two points on the real yield curve: overnight rates and 5-yr rates. Using bond market math, the red line is the market's expectation for what the real Fed funds rate is going to average over the next 5 years. And of course, the real Fed funds rate (blue) is the rate that the Fed is actually targeting. As you can see, the market expects only a modest amount of tightening from the Fed in the years to come. That makes sense only if both the market and the Fed agree that the economy has limited upside growth potential. If the market thought the economy were set to grow at a 3%+ rate for the next several years, the market would immediately assume—and the Fed would probably agree—that there would be a a more aggressive series of rate hikes in the future, not just 3 or 4. Even still, when the Fed raises rates in response to stronger growth expectations, that is not a tightening, it's more a following action. To be really tight, the Fed would have to raise real rates to at least 3%, and the yield curve would have to flatten or invert. Chart #7 compares the real and nominal yields on 5-yr Treasuries (red and blue lines) with the difference between the two (green line), which latter is the market's expectation of what the CPI will average over the next 5 years. With 5-yr inflation expectations today at 2.15%, the market is reasonably sure the Fed will be able to hit its 2% inflation target (on the core PCE deflator, which tends to run about 30 or 40 bps lower than the CPI). Looking ahead, the market sees pretty much the same amount of inflation that we have seen over the past few decades. The market is thus fairly confident that the Fed is not going to do much going forward, and whatever it does, the Fed is unlikely to be too tight or too easy. You may not agree with that assessment, but that's what the market tea leaves are saying. 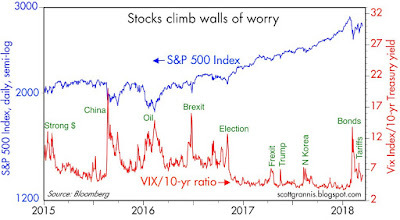 Chat #8 shows how sensitive the stock market is to bouts of anxiety, as proxied by the ratio of the Vix "fear" index to the 10-yr Treasury yield. The latest market correction was triggered earlier this year by concerns that rising nominal yields might threaten economic growth, but that quickly faded, only to worry more recently that Trump's tariffs might spark a global trade war. Whatever the case, the market is not very worried these days, nor is it very optimistic. A general lack of concern about the economy's health is evident in Charts #9 and #10. 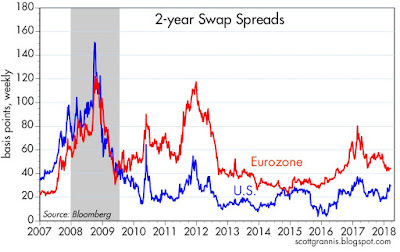 Swap spreads—an excellent coincident and leading indicator of economic and financial market health—are up a bit of late, but still within what might be considered a "normal" range. 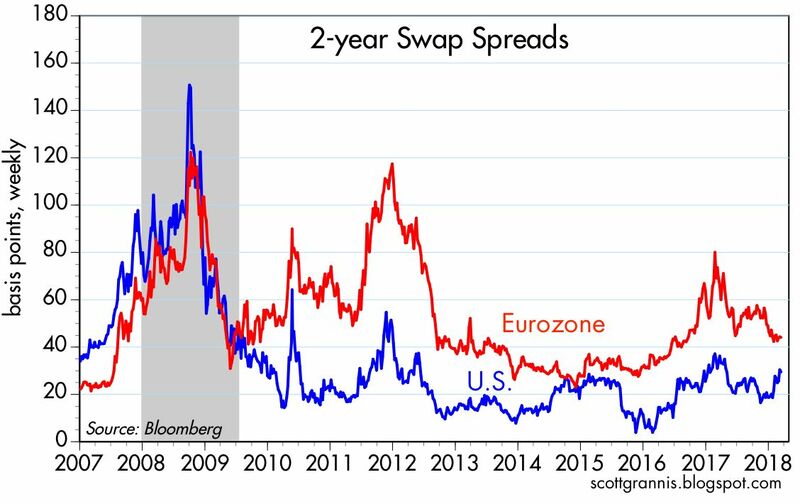 The swap market is reflecting a relative abundance of liquidity and little if any concerns about systemic risk. 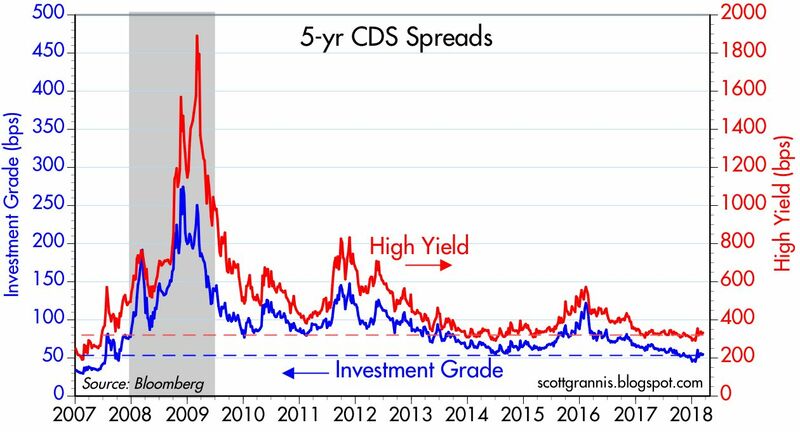 Credit Default Spreads—highly liquid and coincident indicators of the market's perception of credit risk—are also up a bit of late, but still relatively low. As I noted last October, and as has proven recently to be the case, rising growth expectations would almost surely result in an unexpected rise in real and nominal interest rates. 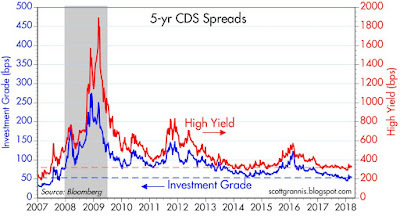 Higher-than-expected rates would depress bond prices, and, in similar fashion, could depress the market's PE ratio (which is the inverse of the earnings yield on equities, and thus similar to a bond price), thus limiting further gains in equity prices to a rate that is somewhat less than the increase in earnings. The days of booming equity markets are fading, but there is still decent upside if and when the market begins pricing in faster growth and the business community follows through with increased investment and faster jobs creation. 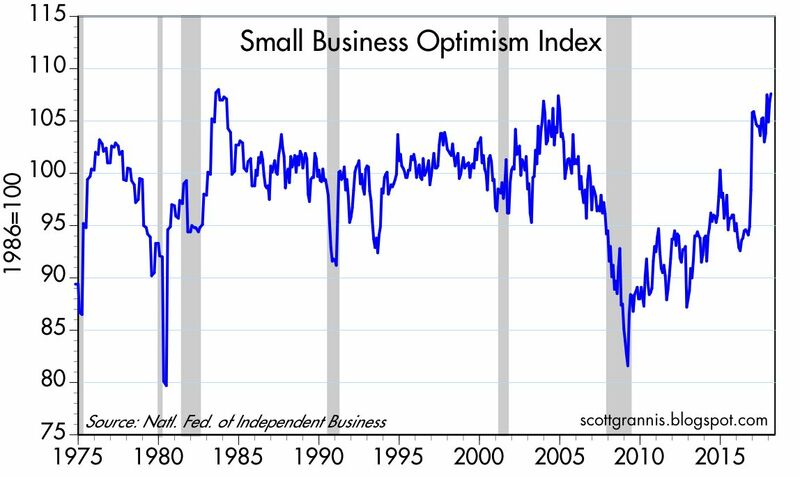 Meanwhile, there is no obvious reason to worry about a recession or a major stock market correction. 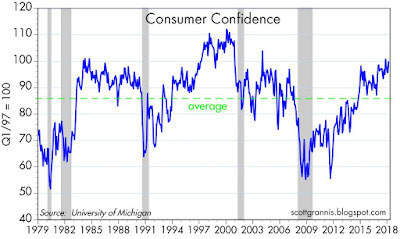 What’s missing from all these charts is the dollar and how foreign central banks might respond. Is it possible that the dollar and deficits will also tell us which way we are headed? If the dollar continues to depreciate significantly – then the world markets are in charge. On the other hand, if the dollar is relatively stable, especially in the face of widening deficits – that could mean Emerging Market Central banks are intervening to prevent their currencies from appreciating. Bad for our exporters, but good for sharing costs. In other words, will the growth of savings stay within the US and be used to leverage the Federal Government? If so, that could be potentially catastrophic if sustained in the long term. I'm not sure which is the better poison, but just thinking about how this might play out. Another great wrap-up by Scott Grannis. Boy, there is world of tales in Chart #1. I do not believe the negative nellies, that something has changed and now the economy cannot grow as it did for decades and decades before 2008. I think the Fed has suffocated the economy, and that their 2% inflation target, which they introduced in 2009 and never reached, is probably too low. Now, safely out of office, Janet Yellen agrees. I sure hope Jerome Powell does not think a 2% ceiling is sacrosanct. The good news is that Kudlow has indicated acceptance of what is called NGDPLT. Probably a better way to go. The US may be giving up $3 trillion in output a year to satisfy a central banker theory that inflation must be below 2%. 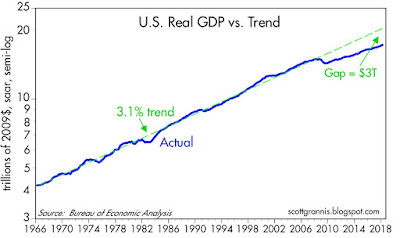 You see all those years of 3.1% annual growth before 2008? In how many was inflation below 2%? For the last 40 years, I have heard the dollar will collapse. Also that inflation will explode, and that interest rates will be higher next year. Instead, we have seen long-term secular downtrends in inflation and interest rates. The dollar got stronger until 2000, and then flattened out. Maybe this time is different, and the dollar declines and we get double-digit inflation and 18% mortgages again. But I think the Fed bias is too tight, rather than too loose. Reason from there. The main structural impediment in the US economy remains property zoning. PS Scott Grannis touches upon an interesting topic: US labor markets actually softened in the February report. There were 806,000 people who entered the labor market, and 313,000 net jobs growth. We have an additional 500,000 people ready to work. A work ethic is the key to life, for a person, a family, a city, a nation. I sure hope everything is done to encourage working, from taxes to wages to regulations to less social welfare. Andrew: I agree that the dollar is a critical variable to watch, and I should have included a chart of the dollar in this post. Suffice it to say that the dollar has been relatively stable over the past few months, and is equal to or slightly stronger than its long-term, inflation-adjusted value vis a vis other currencies. If the dollar falls further I would be concerned. If it strengthened dramatically I would also be concerned, since that would be a sign that the Fed was being overly restrictive. As for the federal deficit, only time will tell. For now the deficit is manageable. I'm expecting to see it remain relatively stable or lower vis a vis nominal GDP, since I think we'll see a stronger economy and a growing tax base that will at least offset lower tax rates. Economic growth is the key variable here. Everything hinges on whether or not the tax cuts work their magic. Blackrock is buying back shares, not more junk debt. Smart guys. Little explanation in news release. Maybe actions speak more loudly than words. Cameron, re rising libor/ois spread. This is disconcerting, of course, but no one seems to have a good reason why it's happening. Could be technical (tomorrow's FOMC might be more aggressive than expected? ), could be related to corporations repatriating tens of billions of overseas profits. For now the spread widening seems relatively contained to the front end of the curve. Meanwhile, the dollar has been nicely stable for the past month or so, and gold is slipping on the margin (weaker gold is symptomatic of a stronger dollar) and commodity prices seem relatively stable. Scott, I have long read your posts. Thanks for all the work you put into this. David: many thanks, happy to know you appreciate the blog.